A solo Destroyer set is a treat in and of itself, and Dan Bejar sweetened the deal by showcasing some new material. Despite Destroyer's diverse oeuvre, the songs contain a common backbone, exposed by the stripped-down arrangements: Bejar's distinctive voice; verbose, reference-laden lyrics; and winding song structures that rarely circle back to the same section. All that is to say that a solo Destroyer set offers no indication as to what direction Bejar will take for his upcoming record, which seems solely dependent on his rotating cast of collaborators and his whims. Nevertheless, it was an eye-opening look at the one constant fixture of the project, and the ties that bind his diverse repertoire. Though Destroyer songs in their studio and full band live versions are awash in lush orchestration, the solo set was a perfect way to hone in on Bejar's lyrics. One new track finds him conjuring instruments, à la Mike Oldfield's Tubular Bells — given the stripped-down nature of the solo performance, one had to imagine what "cue synthesizer," "cue guitar," "cue fake drums" would lead to. 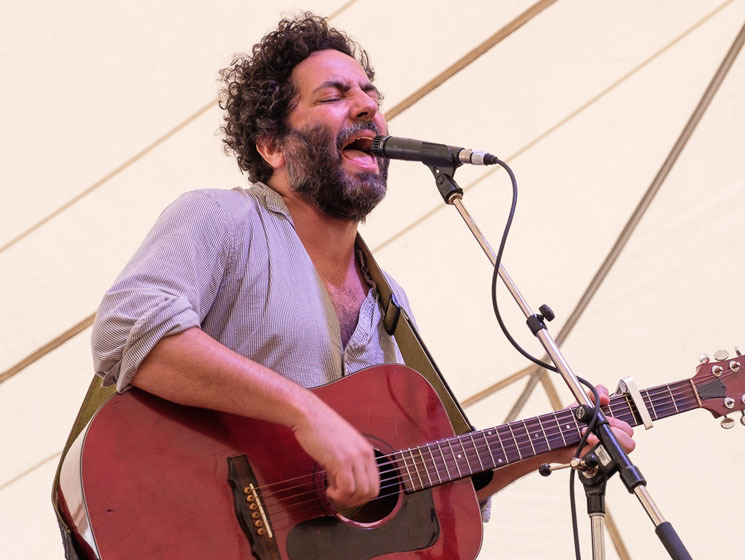 The set also featured a trip through Destroyer's discography, songs from as far back as 1998's City of Daughters, from which he played a spirited version of "I Want This Cyclops." Full-band live sets are heavy on newer material due to the set lists often needing to conform to the strengths and talents of the band, but with no band, Bejar embraces the freedom to dive deep into the annals of his songwriting for pleasant renditions of some of his most beloved tracks.